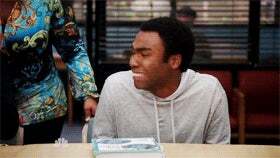 Reports have surfaced that Donald Glover wants to focus on some Childish-assed rap career, so we only get FIVE Troy-including episodes out of thirteen next year. Good god, man. You're going to be cancelled soon enough. Can't you rap then?? ?